RBTH presents a selection of views from leading Russian media on international events, featuring reports on protests against the authorities in Moldova, an invitation to foreign celebrities to buy property in Crimea, and Argentina’s ambitions to join the BRICS group of developing nations. 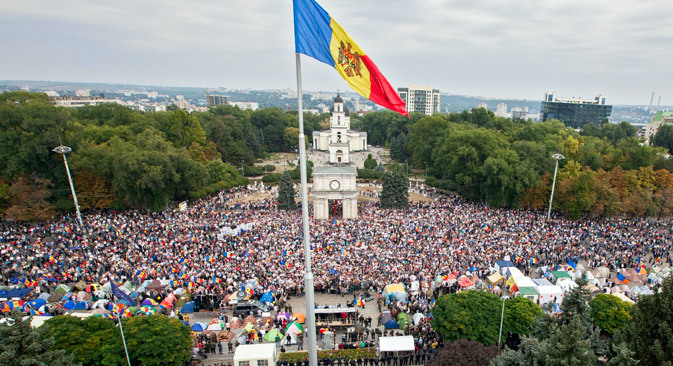 Moldovan fall: Can Kiev scenario be repeated in Chisinau? A correspondent of the Kommersant Vlast business magazine reports on events in Chisinau, where a tent camp has been set up in the center of the city since Sept. 6 and thousands of people have been taking part in a protest against the incumbent authorities. However, even when tens of thousands of people (from 20,000 to 100,000, according to various estimates) took to the streets, the authorities refused to meet the protesters’ demand for resignations. “One could replace ‘bad’ Moldovan Europeans with ‘good’ ones. But the problem is that the ruling parties have neither positive ideas nor strategies. The problem is that there is a shortage of personalities,” says Mark Tkachuk, a former presidential adviser and parliamentarian. According to experts, the new authorities in Moldova could equally turn out to be pro-Western or pro-Russian. And there is a strong probability that Moldovan society may split into supporters of the European and the Eurasian paths. This split has remained unbridged since the country gained independence because politicians find it much easier to engage in an exciting political struggle that brings swift dividends rather than deal with the boring matters of developing the country and fighting corruption, Kommersant Vlast concludes. Crimean leader Sergei Aksyonov has drafted an open letter to foreign actors, musicians and athletes and promised to help them find a place to live, the centrist broadsheet Izvestiya reports. “Last month alone, several international stars announced their intention to seek Russian citizenship: U.S. boxer Roy Jones Jr, who has several world championship titles under his belt, leader of the American band Limp Bizkit Fred Durst, and French actor Samy Naceri,” the letter says. “We can assist them in finding a suitable spot on the coast, in the mountains, amidst the forests and steppes – wherever it is, there will be the breathtaking scenery and wonderful climate of Crimea to enjoy. We shall be only happy if in time Crimea gets its own equivalent of Beverly Hills,” the letter goes on to say. “For example, we would be happy to welcome the famous Hollywood couple Angelina Jolie and Brad Pitt here. As a family with many children, they will find it comfortable and cozy here. We have small spa and recreation centers currently on sale, which they could buy for what to them is little money, refurbish them and then go on to adopt even more children,” said head of the administration of the resort town of Yevpatoria, Andrei Filonov. Vladimir Khryunov, Roy Jones Jr.’s promoter in Russia, told the paper that the boxer is planning to settle on the Crimean peninsula. Argentina has expressed the desire to join the BRICS group of developing nations (Brazil, Russia, India, China and South Africa), independent online publication Svobodnaya Pressa reports. Argentinian President Cristina Fernández de Kirchner has asked former Brazilian President Lula da Silva for assistance in the integration. “Lula, you should become an envoy (to BRICS) so that Argentina is integrated into BRICS and the association becomes known as BRICSA,” she said at an event in Buenos Aires. Currently, the BRICS countries account for about a quarter of global GDP, 40 percent of the world’s population, and 40 percent of global energy production and spending on research. However, is the association truly capable of building a new world order or providing partners with adequate conditions for cooperation? The list of countries which could in future join BRICS includes Indonesia, Malaysia, Mexico, Argentina, and Turkey. “At the moment, this association unites spiritually different civilizations: the Chinese, the Indian, the European, and the late European, as represented by Brazil. In the course of a dialogue, decisions are developed that are clearly beneficial for the members of this association,” he said. What is behind Sarkozy's call for cooperation with Russia?